The castle garden is divided into a more formal, Baroque style garden, an herb garden and a lawn with shady areas for sitting outside and relaxing. A small pond with its frogs is especially attractive to kids. Smaller children will enjoy the sand pit I dug in 2008. With its various flowers and herbs, the castle garden is an attraction year round. You'll find numerous pictures in this photoset on flickr. 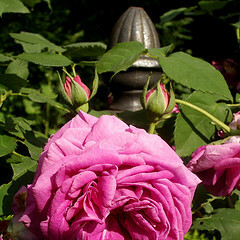 There are some old rose varieties my mother tends to (though I usually get stuck with the pruning).